Last week we had the pleasure of interviewing Jordan and partner Russell from this year’s hottest interiors show, the Great Interior Design Challenge. Known affectionately as the GIDC, the TV show was a competition for interior designers looking to take the next step in their careers. Competing against each other week-on-week, the show culminated in a grand finale which saw Jordan Cluroe and Sarah Moore redesign the interiors of two Georgian townhouses. Although he was pipped to the post on the day, Jordan’s love for bold colours and his experimental designs really captured our, and the design community’s, attention and we were left wanting more. 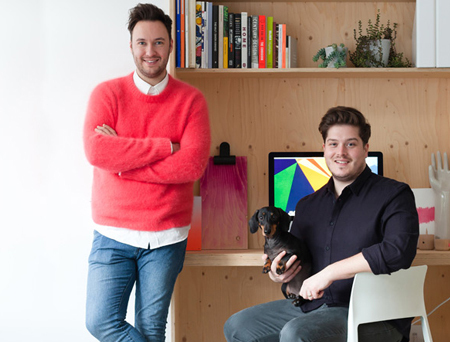 Since the show, Jordan and partner Russell have set up their own interior design practice, ‘2 Lovely Gays’, and are reaping the rewards of the successful TV appearance. 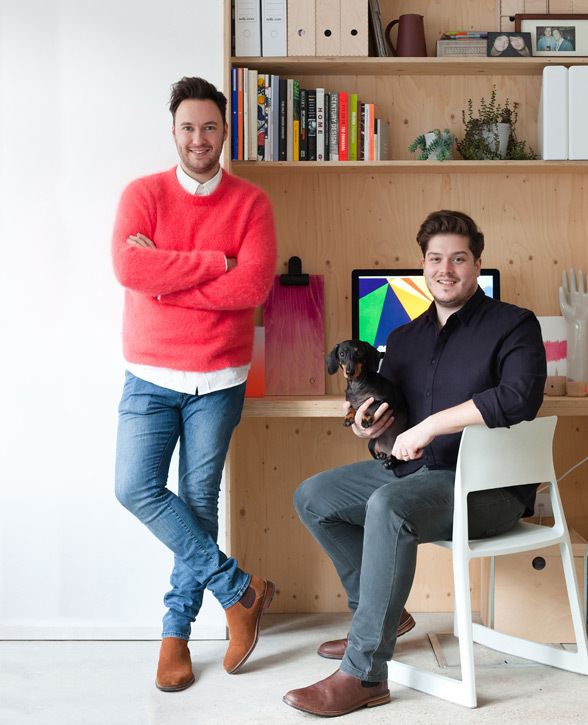 We had a lovely chat with the design duo last week, you can read the full interview below. Hello Jordan and Russell, thanks for chatting with us today. Can you tell us a bit about yourselves and what you do? Jordan: We are an interior design duo. And Husbands. We have been together for 8 years and married for nearly 3. Russell: Originally we both trained as actors so we’ve come at interior design from quite a unique background. We have always been obsessed with good design and I suppose when we met it just fuelled that fire. J: We've spent the last few years gaining experience, and this year we launched ourselves into the interior design scene as ‘2 Lovely Gays’. Where did the name ‘2 Lovely Gays’ come from? R: We bought our first flat together in south east London just over 6 years ago and the postcode ended '2LG'. Our friends started to call us the ‘2 lovely gays’ and the name stuck - now here we are. J: We take design very seriously, but there's no reason design can't be fun - hopefully we strike the right balance. It always raises a smile when people ask for our business name! You both have a passion for interiors and design – is this something you have both had from a young age, or has it developed over time? R: I would say it has developed. We were both artistic at a very early age, but as we have grown, our tastes have developed and evolved. J: We both now feel that we have found our passion in interior design. R: Several years ago we ran a stall at Greenwich Craft Market. We designed our own textiles, experimenting with screen-printing and animal designs (inspired firmly by our mini dachshund, Buckley) which I would say was the beginning of us designing together. J: Actually, having said all that, even as a kid, I was re-decorating our house every opportunity I got. My uncle taught me how to wallpaper when I was just 13. Jordan we loved watching you, and the beautiful rooms you created, on the BBC series Great Interior Design Challenge. Did you enjoy your time on the show? J: Absolutely! Originally we applied as a duo but that didn't work with the format of the show, so we decided I would take the lead on this one. It was an amazing experience - I learned such a huge amount in such a short space of time. The pressures and time constrains of the TV crew were really exciting and, as someone who thrives under pressure, I found the whole experience so much fun! It was amazing to create such varied spaces for a wide range of clients over such a short period of time. The support and response after the show has been incredible and we are really grateful for this amazing opportunity. You’re known for your daring colour combinations and playful sense of style – is this something that you have carried through into your own home? J: Yes. 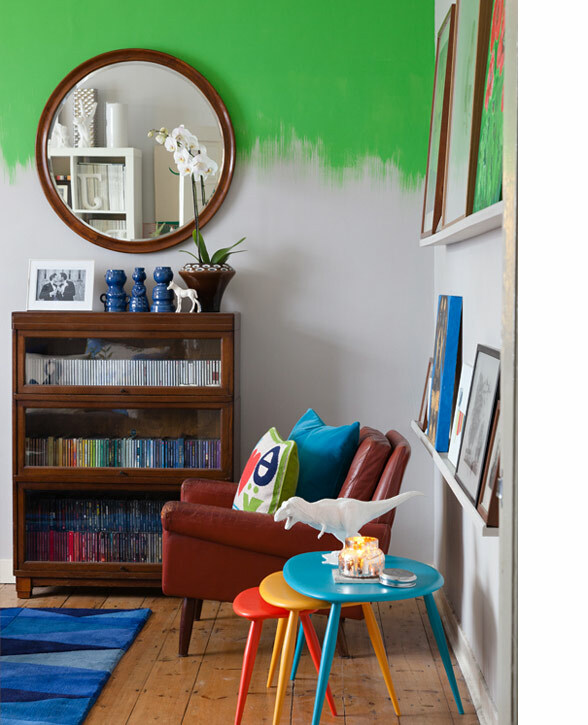 We love to play with colour, and if you use a limited palette in each space it keeps it elegant. People have said that our design schemes often have a characteristic element of wit - like a vintage horse lamp mixed in with an elegant piece of modern Scandinavian design, for example. We absolutely love to mix our classic Hay Mags Sofa with quirky touches. R: We wanted to stay true to the Victorian architecture of our home but we have thrown the rules out of the window in certain areas to keep it fresh. For example the chimney breast in our loft master bedroom had such a great shape, so we cladded the original brickwork shape, which is quite abstract, with exposed plywood. It is beautifully crafted and was a way of keeping the character of the house in a room that was essentially a new construct. A sneak peek inside the home of the design duo. Where do you find inspiration and ideas for your interior designs? Are there any particular magazines, blogs or websites that you particularly enjoy reading at the moment? R: Everywhere! We trained as actors and this has definitely informed our aesthetic. Film, opera, theatre and art all inspire our designs. R: I think because we have both spent years working on stage or on TV sets it has drawn us to very pared back elegant aesthetics where the 'strings' as it were, are visible. If it is functional, it is beautiful - and we like to see the honesty in how something is made or how it works. J: People too. People inspire us. After all a space is to be used by people and we love getting to understand other people to find out what is really going to work for them. J: We follow several blogs. 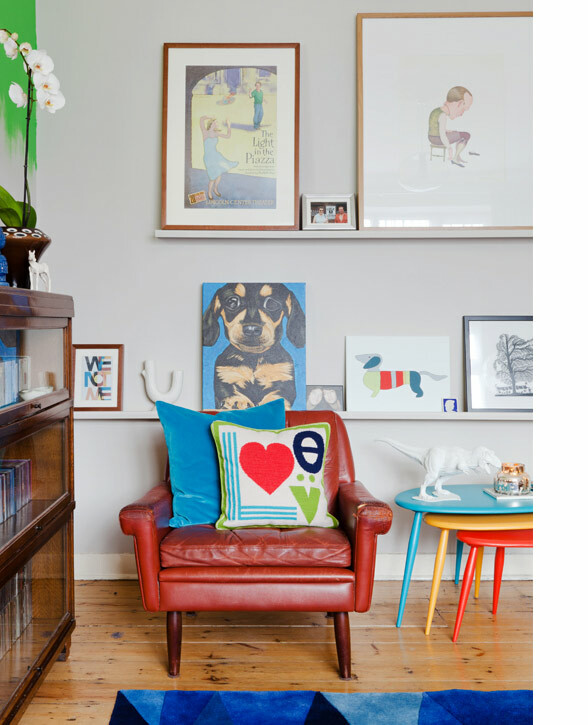 A couple I love are My Friend’s House which is great for up-to-the-minute style with humour and wit. Also ;47 Park Avenue – this is especially great if you want to crush on a gorgeous house! Jordan & Russell love to mix traditional items with modern accessories. Finally, for those looking to get into the field of interior design, what advice, or hints and tips, would you give them? R: Begin. Just begin. Be brave and get started. We have not come at this through 'conventional' roots. We have just felt our way and tried to keep true to our gut instincts. Who wants to be conventional anyway? J: Collaboration is a massive part of interior design. Collaboration with each other as a design duo inspires us every day to be better. Collaborating with clients is a very delicate thing, as is the relationship between the designer and the craftsmen that you will need to see a project through. You have to be adaptable and able to work in a team, whilst maintaining that original vision at all times. R: It is certainly a balancing act. J: Avoid Clutter! It can take up too much of your headspace as well as your physical living space. R: Avoid buying too much! We are massive advocates of buying less but buying right so that you end up building a collection over the years of things that are really meaningful and have quality. J: Also, importantly, avoid 'trends'. A trend will always pass. A classic is forever. 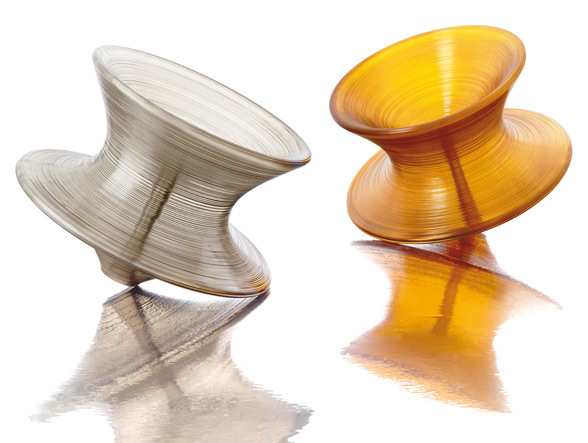 1 Magis Spun Chair by Thomas Heatherwick - we have one in our garden and it is not only sculpturally beautiful but it, without fail, gets a laugh from our guests whenever they play in it! 2 Vitra Tip Ton Chair by BarberOsgerby - I am sitting in one at our desk in the kitchen as we speak, so elegant and comfortable. 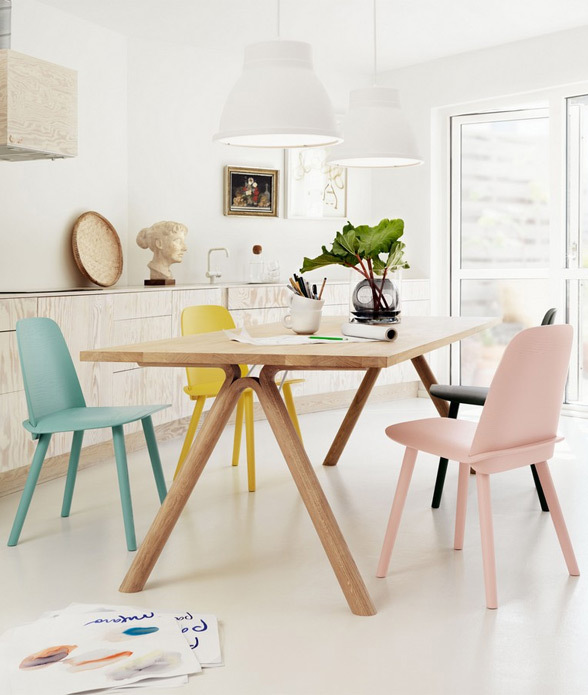 3 Muuto Nerd Chair by David Geckeler - this is so pleasing to look at and the colour options are all stunning. It’s certainly a cute future classic. 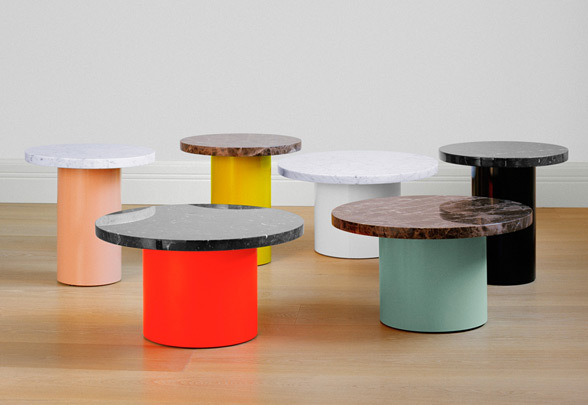 4 Moooi Corks by Jasper Morrison – These are so textural and simple, yet really functional. Yes please, Jasper! 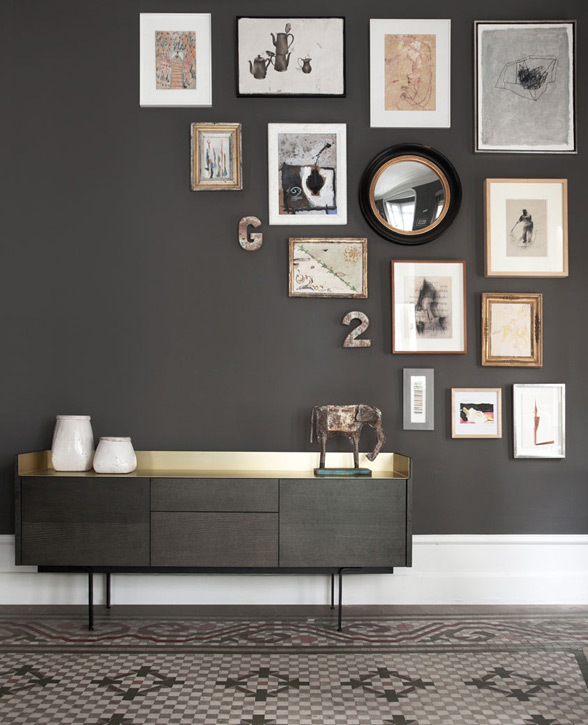 5 Punt Stockholm Sideboard by Mario Ruiz - One day this stunning sideboard will be ours. 6 Hay Minimal Collection Bed Linen by Scholten & Baijings - Simple yet luxurious. The pink colour, Syrup, is our absolute fave. 7 Hay Scissors by Hay Studio - These are beauties; so sharp and pretty and a pleasure to use every day. 8 Another Country Desktop Series Set by Simon Donald - Three materials: rubber, brass, sycamore; three words: tasty, little, morsels. 9 E15 CT09 Enoki Side Table by Philipp Mainzer in mint or flame - This is a new favourite for us. It is solid, honest and cute all at the same time. 10 Flos Piani Table Lamp - We want a white one pretty please! And the new Big Stone version – talk about monumental!